Digital UltraViolet and Digital Copy will makes it possible for you to stream the movie Uncle Drew HD UV Ultraviolet Code instantly to your computer and compatible Smartphones, Andriod, iphone, iPod Touch, iPad and tablets devices anytime, anywhere. 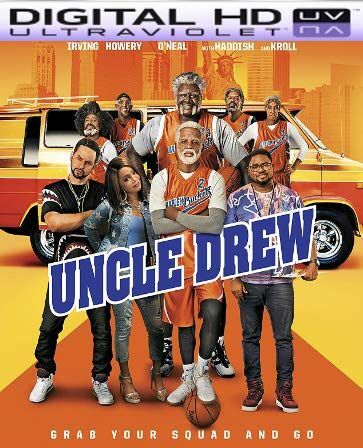 You can also download a Digital UltraViolet Copy or a Digital Copy of the movie Uncle Drew HD UV Code to your computer and compatible devices. 5.0 out of 5 stars When old heads take center stage...or court. Dax is competing his team in the Rutgers classic basketball tournament in hopes of winning 100,000 dollars, and he's dropped every cent he has into it. However, with losing his team to his biggest rival and his gold digging girlfriend, he has nothing. Now, thanks to a legend in basketball who disappeared and never came back, as told to him by an older barber, Dax is on the hunt, and along the way, and when he finds him, has to conform to his wishes, which include gathering his cohorts. A blind man, a man in a wheelchair, a married pastor and his wife and a retiree taught in the ways of kung-fu. Now, with these legends in Dax's corner, he may have a chance. The athletes here are not trained actors, but still, they made this movie fun, and it had quite a bunch of laughs. Kyrie Irving's Uncle Drew is just as lively and magical on film as he is in the commercials. I didn't take it seriously AT ALL, and you shouldn't either. TOTAL FUN TO BE HAD!! !